Seasoned demography geeks know to anticipate the release of the UN Population Division’s World Population Prospects in the spring of odd-numbered years. An off-cycle update published last month in Science, summarizing new results and methodological changes to the projections, therefore provoked a buzz of interest and a mini-flurry of media coverage. Changes to its methodology have allowed the UN Population Division (UNPD) to project an 80 percent probability that the world’s population will be between 9.6 and 12.3 billion by 2100. The 2050 projections have new ranges as well. For the world, the UNPD projects an 80 percent probability that population will reach between 9.2 and 9.9 billion in 2050. The range under the low and high variants is much broader, at 8.3 to 10.9 billion. These narrower ranges may allow observers and policymakers to move away from fixating on the single medium-variant figure as an exact projection, which is almost guaranteed to not be precisely correct, and instead think in terms of a reasonable range of high probability. The latest results reflect ongoing changes to the UNPD’s projections methodology intended to make them less deterministic. For decades, the agency projected a single future fertility rate for each country under a limited number of scenarios based on unvarying assumptions. In the case of the oft-cited medium-fertility variant, all countries were projected to achieve a total fertility rate of 1.85 children per woman, regardless of current rate or recent trends. This methodology was relatively simple to understand, but was criticized for being too simplistic, “ill-defined,” and vulnerable to error. Since the 2010 Revision, the UNPD, in collaboration with the University of Washington and now the National University of Singapore, has been incorporating probabilistic projections into its analysis. Using Bayesian hierarchical models, this new approach adds quantified uncertainty to the projections to project a range of possible demographic parameters for each country. Two sets of data are used to project future fertility in countries where it remains high: the historical experience of countries that have already experienced fertility decline, and recent trends within the individual country in question. The model generates 60,000 individual fertility trajectories for each country, incorporating a variable to add a measure of randomness. The median trajectory is then classified as the medium-fertility variant. The major revelation of this year’s update, which builds on the complete set of results published last year in the 2012 Revision, is the introduction of probability intervals for aggregated groups of countries, including the world (the intervals were already available for individual countries). The UNPD demographers and their partners intend these intervals to be more empirically sound than the high- and low-fertility variants, which simply add and subtract 0.5 children per woman from the medium-fertility variant. In addition, new data from countries with high HIV prevalence has been incorporated. Although this series of changes has added significant complexity to the projection methodology, perhaps making it less readily understood, it is intended to be more realistic and accurate than the previous approach. National Geographic’s coverage of the new projections highlighted their contrast with those prepared by the International Institute for Applied Systems Analysis (IIASA). IIASA has used probabilistic techniques since 1997, feeding them into scenarios used by the Intergovernmental Panel for Climate Change (IPCC) to model environmental changes. In a forthcoming article in Global Environmental Change, two IIASA demographers present the results of their projections aligned with the five Shared Socioeconomic Pathways (SSPs), which the IPCC and the climate research community at large are integrating with greenhouse gas emissions scenarios. 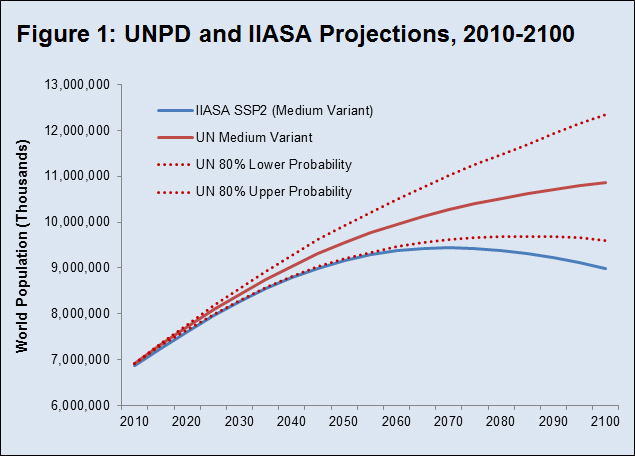 There are several methodological differences between the IIASA and UNPD projections. The IIASA projections explicitly account for the role of female education in influencing fertility. Women with more education generally have fewer children, and IIASA has conducted groundbreaking research modeling this relationship. In a previous publication, its demographers projected that education alone could account for a difference of more than 1 billion people in the 2050 global population. IIASA also assumes a lower fertility floor, at 1.75 children per woman compared to the UNPD’s replacement level (around 2.1). And IIASA incorporates extensive consultation; they surveyed and convened more than 550 demographers and other experts to establish the parameters and assumptions of their projections. The results produced by the two agencies are in turn quite different (see Figure 1). IIASA’s medium variant is aligned with SSP2, which assumes medium fertility, mortality, migration, and education levels in the future and is described as “middle of the road.” In contrast to the UNPD’s forecast of continued growth, it projects that total population will peak around 2070 at 9.4 billion and decline gradually to 9 billion by 2100. Much of this slowdown in population growth is due to the agency’s education assumptions. The IIASA demographers project the percentage of African women in their peak childbearing years who have attained secondary or higher education will increase from 37 percent in 2010 to 68 percent in 2050. The demography of the world’s most populous country is also a factor. In National Geographic, Wolfgang Lutz, who directs IIASA’s population program, noted his team’s disagreement with the UNPD projection that China’s fertility rate will rebound from the current rate of 1.6 to 1.9 by 2100; instead they expect it will remain low. The UN Population Division has long grappled with the challenge of how to make projections for regions of the world where demographic trends are not following the historical trajectories outlined elsewhere. This has been a particular issue for fertility rates in sub-Saharan Africa, which have not declined as quickly or linearly as in other regions. The UNPD elects to assume that these stalls are temporary, in particular given “investments to accelerate access to modern contraceptive methods” through the Family Planning 2020 initiative. In their Science article, the UNPD team notes the weight that Africa’s fertility transition carries in influencing their projections. They focus on Nigeria, where they estimate that fertility has barely declined from 6.35 in 1950 to 6.0 in 2010. Although country-specific trends are included in their projections, the influence of other countries’ past trajectories remains strong, as the medium-fertility variant for Nigeria still projects a steep decline to 3.8 by 2050 and just above replacement level at the end of the century. New Demographic and Health Survey results for Nigeria, although estimating a slightly lower current fertility rate of 5.5 children per woman, indicate that the rate has dropped by just 0.2 children per woman in 10 years, and that family planning use has been stagnant for five. The Science article mentions the possibility of a demographic dividend in Nigeria, but this must be considered a very distant prospect if current trends continue. While the future trajectory of demographic heavyweights like Nigeria remains debatable, the good news is that fertility stalls are by no means a universal phenomenon in Africa. The new Performance Monitoring and Accountability 2020 project, which conducts rapid, representative public health surveys using mobile technology, has generated findings that reinforce earlier positive indications in several East African countries. In Kenya, modern contraceptive use among married women grew by 16 percentage points in six years, to 55 percent currently, and fertility has fallen to 3.5 children per woman. In Ethiopia, contraceptive use is growing nearly as quickly, at about two percentage points per year, and fertility fell from 4.8 to 4.3 children per woman in three years. These contrasting and rapidly evolving pathways in a handful of countries among the hundreds that demographers must assess illustrate the sometimes vexing but always fascinating dilemma of socioeconomic forecasting. The UNPD’s methodological refinements aim to make their projections as objective as possible, but as IIASA’s expert opinion-based technique demonstrates, predicting human behavior will always be an art as well as a science. Sources: Bongaarts and Bulatao (2000), The Economist, International Institute for Applied Systems Analysis, National Geographic, National Population Commission and ICF International, PMA 2020, Science, UN Population Division. 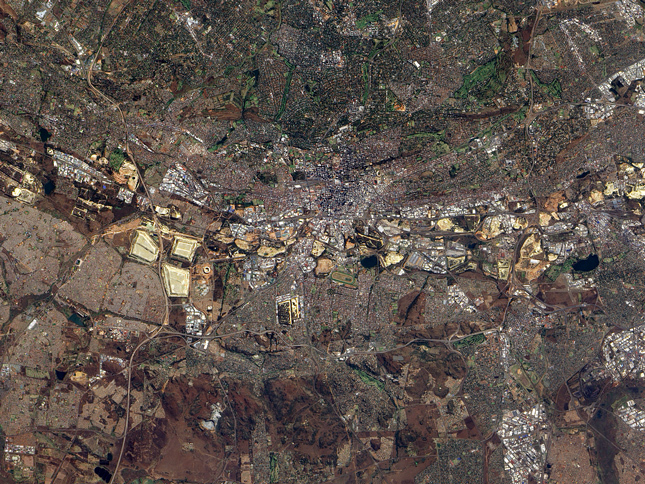 Photo Credit: Construction in Johannesburg, South Africa, from space, courtesy of Jesse Allen/NASA Goddard Space Flight Center. Chart: Elizabeth Leahy Madsen.